NBA TV’s NBA Inside Stuff presented by Samsung Galaxy will debut a new episode Saturday, Jan. 17, at noon ET featuring Orlando Magic forward Tobias Harris and his mother, Lisa Harris. The two will reflect on the story of Harris’ grandfather, John Mulzac, a pioneering Tuskegee Airmen during World War II who inspired Orlando’s emerging star to achieve his dreams. Hosted by Grant Hill and Kristen Ledlow, the 30-minute show will look ahead to Martin Luther King, Jr. Day as it celebrates the history of the courageous group of African-American military airmen in which Mulzac served. Additionally, this week’s show will follow Portland Trail Blazers star power forward LaMarcus Aldridge as he gives Ledlow a driving tour of his hometown of Dallas. During a visit to a local barbershop, the pair discuss everything from his love for Michael Jordan and Space Jam to how Aldridge and the Trail Blazers are building on last year’s success. The episode will also provide viewers with an all-access look at Wizards guard Bradley Beal’s grueling workout routine, along with a piece following Thanasis Antetokounmpo of the NBA D-League’s Westchester Knicks as he pays a visit to Madison Square Garden to watch his little brother Giannis and the Milwaukee Bucks take on the New York Knicks. 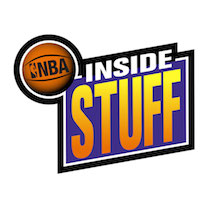 NBA Inside Stuff presented by Samsung Galaxy is televised Saturdays at noon throughout the season. The show includes brand extensions across the entire NBA Digital portfolio and social media integration across all platforms. NBA Digital is the NBA’s extensive cross-platform portfolio of digital assets jointly-managed by the NBA and Turner Sports including NBA TV, NBA.com, NBA LEAGUE PASS, NBA LEAGUE PASS Broadband, NBA Mobile, NBADLEAGUE.com, and WNBA.com.